Leading B2B Publication includes PINC’s CEO to its Annual List of the Supply Chain’s Top Professionals. Union City, CA, March 05, 2019 --(PR.com)-- PINC, the number-one provider of technology and solutions for yard management, finished vehicle logistics, and inventory management to the world’s leading brands, announces today that the company’s CEO, Matt Yearling, has been selected by Supply & Demand Chain Executive magazine, the executive's user manual for successful supply and demand chain transformation, as 2019 Pro to Know in the supply chain industry. 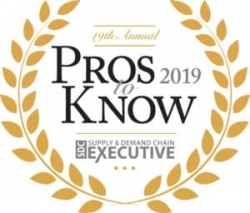 The Pros to Know Awards recognize supply chain executives, and manufacturing and non-manufacturing enterprises, that are leading initiatives to help prepare their companies’ supply chains for the significant challenges of today’s business climate. This year’s list includes more than 200 individuals from software firms and service providers, consultancies or academia, who helped their supply chain clients or the supply chain community at large prepare to meet these challenges - and more than 40 Practitioner Pros, who do the same within their own companies. Yearling was awarded for leading the way in educating the industry about inventory challenges and for showcasing how organizations that have invested in digital inventory technology are gaining an edge in better understanding inventory levels and are being able to move inventory faster throughout the supply chain. PINC provides scalable software, hardware, and services that enable companies to identify, locate, and orchestrate inventory throughout the supply chain predictably and cost-effectively. The company's cloud-based real-time tracking platform, powered by aerial inventory robots™ (drones) and an Internet of Things (IoT) sensor network that includes passive RFID, GPS, computer vision, cellular, and other sensors, provides actionable insights and connected expert guidance that allow organizations to optimize their supply chain execution. Please visit PINC at www.pinc.com.